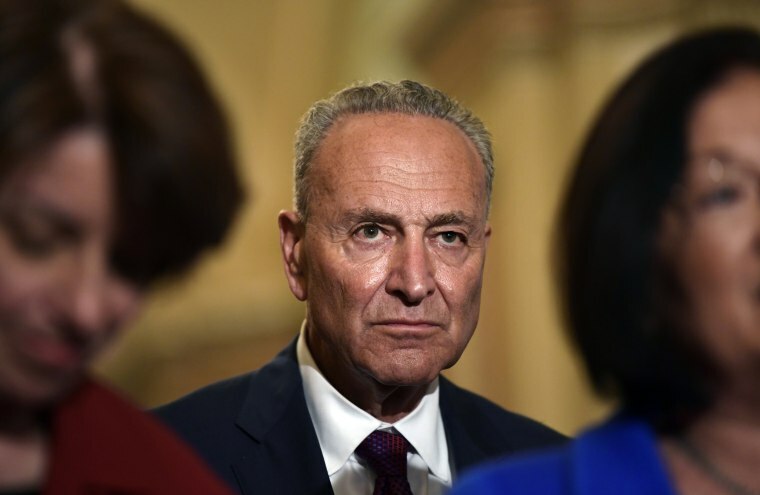 "It undermines our efforts when members of the public don't see their elected leaders in Congress reacting with more fury," said Brian Fallon, a former Schumer aide. The goal: figuring out how to derail President Donald Trump's Supreme Court pick, conservative appellate judge Brett Kavanaugh. Up to now, participants say the strategy sessions have been cordial. Yet with Senate Judiciary Committee hearings just two weeks off, cracks in the alliance are showing. Schumer, D-N.Y., who plans to meet Kavanaugh privately early this week, is methodically building arguments that would help vulnerable Democratic senators in Trump-loving states vote "no," while avoiding explicitly pressing them. But the party's restive left wing says he's not aggressively rallying Democratic lawmakers to oppose the nominee, thwarting the momentum needed to galvanize voters and maybe even win the uphill fight to block Kavanaugh. "It's really a test for Schumer," said Elizabeth Beavers, associate policy director of Indivisible, an anti-Trump group. "Is he going to be the minority leader who lost Roe?" Roe v. Wade is the 1973 Supreme Court decision that established abortion rights. "We're looking to Sen. Schumer to unite the Democratic caucus to fight Kavanaugh," said Ben Wikler, Washington director of the activist MoveOn.org. He said unless leaders unify the party and raise the battle's visibility, the news media will focus on Trump nemeses like fired White House aide Omarosa Manigault Newman and lawyer Michael Avenatti. It's the latest manifestation of the Democratic debate over how ideologically pure and confrontational the party's strategies and candidates should be in resisting Trump and his hard-right stances. That battle has played out in Democratic congressional primaries around the country and in Congress, where left-wing lawmakers are pushing proposals like universal health care that other Democrats shun. Democrats agree that Kavanaugh's confirmation would tip the nine-member court to the right, threatening abortion rights, former President Barack Obama's health care law and constitutional constraints on Trump's actions as president. Even so, the votes of three moderate Democratic senators facing difficult re-election races seem up for grabs: Indiana's Joe Donnelly, West Virginian Joe Manchin and Heidi Heitkamp of North Dakota. A few other Democrats are seen as uncertain, from Alabama and Florida, for example, while about 20 who are considered certain to oppose Kavanaugh haven't declared their positions. "It undermines our efforts when members of the public don't see their elected leaders in Congress reacting with more fury," said Brian Fallon, a former Schumer aide now heading Demand Justice, a Democratic-aligned liberal group trying to sink the nomination. Fallon said there is "urgent need for Democrats to unite quickly against Kavanaugh in order to shift the dynamic here." Republicans have a 50-49 Senate edge, excluding the absent and ailing Arizona Republican John McCain, so Democrats alone can't stop a united GOP. Schumer's hopes of defeating Kavanaugh lie in unearthing game-changing revelations in documents from his earlier White House and judicial jobs, or creating an irresistible groundswell against him among constituents of moderate Republicans and vacillating Democrats. "Our job is to convince the American people he will undo women's reproductive freedom and undo health care," Schumer said in a brief interview when asked about liberals' complaints about his efforts. Abortion rights, environmental and other liberal groups applaud Schumer's measured tactics, which have included Senate speeches and news conferences and frequent conference calls with outside organizations. Schumer's focus on Kavanaugh's perceived threat to abortion rights is aimed at pressing moderate GOP Sens. Susan Collins of Maine and Alaska's Lisa Murkowski. Talking about health care provides ammunition to Democratic senators from GOP-leaning states, where the benefits of Obama's health law are often popular. "What really matters is not so much what happens in Washington but what constituents think in Indiana, West Virginia and North Dakota when they realize Kavanaugh would take away their health care," said Nan Aron, president of the liberal Alliance for Justice. Liberal activists are adamant that Kavanaugh would be a vote against "Obamacare" on the bench, particularly in a coming case challenging protections for people with pre-existing conditions. But an Associated Press review in July of Kavanaugh's decisions, other writings and speeches provided few clues about how he might rule on the law. Schumer is also increasingly focused on the GOP's refusal to request the release of millions of pages of documents from Kavanaugh's three years as President George W. Bush's staff secretary, which could reveal the nominee's views on touchy subjects like torture of terrorist suspects, abortion and government eavesdropping. With many documents probably remaining secret until after a Senate confirmation vote that could come by Oct. 1, Schumer's subtext for senators backing Kavanaugh is: Beware. "Those documents will come out eventually and senators will really have egg on their faces if they voted for someone without knowing what was in their record," said Kristine Lucius, a vice president of the Leadership Conference on Civil and Human Rights. Mindful of November elections in which Democrats have an outside chance of grabbing Senate control, Schumer seems to be giving his red-state senators space to back Kavanaugh if Republicans assure his confirmation by remaining united. It also makes sense because with moderates always trying to show their independence, "If the leadership tried to twist the arms of redder state senators, it would backfire," said Sen. Chris Murphy, D-Conn. Even so, liberals say Schumer is not living up to his promise in July to oppose Kavanaugh "with everything I've got." "It's pretty reprehensible that they haven't voiced their opposition to Kavanaugh already," said Shaunna Thomas, executive director of Ultraviolet, a liberal women's advocacy group.